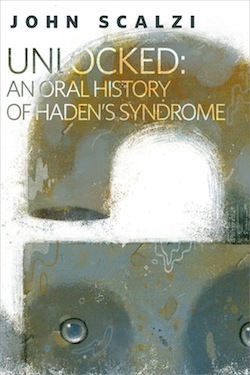 Unlocked: An Oral History of Haden's Syndrome was published a few months ahead of his brilliant 2014 novel Lock In. Crafted as if it were a series of monologues from Haden’s researchers, technicians, engineers, medical personnel, and Haden’s survivors, this novella traces the beginnings of the flu-like virus, through its devastating pandemic, the ravages left after 400 million people globally had died and the discovery of the percentage of survivors who are “locked in”, effectively trapped in their bodies, awake and aware but unable to move or respond to stimuli.Scalzi’s adept use of personalized speech and interview like production leaves the reader with a clear fictional history of a possible future. Beginning as the “Superbowl” flu, care providers soon realize they re dealing with something far worse. Scalzi’s interviewees look back on the early years of the disease with fear and growing apprehension.As with it’s companion novel Lock In, Scalzi then describes the genesis of a new class of people. By showing the overnight creation of a new “ethnic” group, Scalzi is able to intelligently examine and illustrate how our society deals with Constitutional, social and economic issues from its inception.Most noteworthy is the remarkable way that America deals with the plague. Scalzi uses the Haden epidemic, as a vehicle by which he explores what is best and worse with our democracy and what it could do.Provocative and absorbing Scalzi has shown a future that could too easily be and a glimpse at what we could become.Very good. (Free to read here)If you want to sell something, you have to give it away for free.Or at least that is what I am assuming the thought was behind Tor's release of this novella. And as far as I am concerned, it worked on me, I am now really looking forward to Lock In, the book this novella provides background for.This read much like World War Z: An Oral History of the Zombie War, though highly compressed. Several paragraphs, at most, instead of pages from a whole slew of different people. Given this format we don't get much character development, more like a nicely packaged and sleek info-dump. Don't get me wrong, it wasn't just an info-dump with different names attached to the paragraphs, some personalities certainly came through and the information that was being dumped was from very specific perspectives. It was a very effective technique for setting up the future society we will find in Lock In.What I am most appreciative of this novella for is showing how seriously Scalzi is taking his near future society. The terrible epidemic that hits the world, causing death and a condition known as "locked in" (basically comas where the person has full awareness of their surroundings) results in massive social problems. Overwhelmed hospitals, death or sickness of prominent people, long term care issues for the survivors.Instead of a miracle cure materializing out of thin air, there has to be a public policy process to organize research and allocate funds. People love the sausage, but hate seeing it made. On top of that, once some treatments and solutions are developed there are further social repercussions as locked in people navigate society through robotic avatars, facing a unique challenges and developing their own culture (Scalzi makes a smart analogy to deaf culture in this regard). I applaud Scalzi for embodying the essence of science fiction, taking some technological advancement and extrapolating its impact on society as a whole. I am very excited to read more about the world he created. Everyone says that if you read Lock In, you must read this little supplemental book called Unlocked. I am going to be the one dissenting voice and say that you don't.If you want more on the world, if you want more information about Haden's, especially about the science behind both Haden's and threeps, then go for it.Frankly, I found it rather boring, since it isn't really a story - it's a history. It's like a long newspaper feature article, or something.Also, people say: You should read this before you read Lock In. But again, I am going to dissent and say, "Read it afterwards. And only if you want a deeper look at the science and society." This is classified as prequel to Lock In but personally I think it's better to read it after you're done with the novel. While it won't spoil the plot in any way, it does destroy the slow immersion into the world. However, I recommend reading it because it helps a reader to understand the nature of the Hadens plague and gives a look at what the world was like when it first hit. It also showed the best of humanity in the way they banded up to fight it, preserve and change the world so those afflicted can be part of fit. This is a TOR short piece which acts as more of an introduction rather than a prequel for John Scalzis' Locked In novel. Its presented as a series of conversation exerts charting the initial out break and development along with the milestones along the way. Presented from perspective of 25 years after the outbreak it reads very much like a transcript from a documentary which considering Mr Scalzi that is hardly a surprise since he is well versed with various media as well as being an accomplished writer. The book really sets the scene for the main book the afore mentioned Locked In and as such does not really give anything away just I guess eases the reader in so they are familiar with the syndrome and the tools available to tackle the aftermath. The story (if you could call it that as I explained earlier) is a free digital story although I have seen it being listed as 60+ pages long is quite a quick read but is very informative and I am now intrigued to see how it fits in with Locked In, I guess we shall see. 4 of 5 stars at The BiblioSanctum http://bibliosanctum.com/2014/08/25/b...If you haven’t read Lock In yet and have concerns about being overwhelmed by the details of Haden’s Syndrome, or if you’ve finished the book and would like to know more, I highly recommend checking out this companion novella that you can actually read online for free here.Told in an epistolary format in the form of collected interviews, Unlocked features narratives from many different people, all in one way or another intimately involved in the history of Haden’s Syndrome and the Great Flu that precipitated it all. It’s meant to give you more information about the condition, as well some history on how the world struggled with and recovered from the epidemic only to end up trying to find a way to help the millions that experienced “lock in”.Through the various perspectives, we get to find out what the devastating flu was like, how it was spread, as well as the response when everyone realized that the illness was unlike anything the world has ever seen. The most relevant part, of course, is what happens afterwards, when Haden’s Syndrome rears its ugly head. As someone who read Lock In first before checking this out, I knew that President Haden had a major role in galvanizing the country and uniting everyone’s efforts in finding a way to help the victims of the condition, and I was so happy that I got to have the whole story of how it happened here, in all its glory.Just in keep in mind that this novella is meant to inform, so it wouldn’t be fair to go into this with the usual expectations for a story. There’s not a lot of plot or character development, which is okay because that’s not its goal. Nonetheless, I was completely fascinated by the way this book went through the different stages of the whole Haden’s Syndrome saga. Several of the characters also made themselves stand out with distinct “voices” as they related stories of their experience with Haden’s.Unlocked shows just how invested John Scalzi is into the world of his book Lock In, and perhaps he rightly recognized that readers will want to know more about it. It probably doesn’t matter whether you read this before or after you read the full-length novel, but all I can say is, either way it’s worth it. Nice background-slash-companion piece to Lock In, and the multiple voice actors give it a feel of authenticity. Tells the history of Scalzi's Lock In universe, making some sense of how the world came to be.Came as part of the audiobook I read for Lock In -- the final two-ish discs. My text copy did not have this "bonus novella" included. This is an intro novella to Scalzi's forthcoming Lock In, and my only complaint is that now I have to wait so long to get the real thing.Haden's Syndrome is an epidemic sweeping a near-future world, and that already had me hooked, because I'm a huge fan of epidemic stories, zombies included (though this isn't a zombie book at all).Speaking of zombies, that "oral history" in the title should remind you of World War Z: An Oral History of the Zombie War, because it's written in a very similar fashion. Think more overarching narrative and less characters and scene. Again, I'm a fan.It can be hard when presenting short snippets of interviews to introduce any sort of character or narrative voice, but this has been a strength of Scalzi's that I've noticed since Redshirts: putting you in somebody else's shoes with only a few sentences. His journalism background surely helps with the tone, too.The first part of this novella lays the ground work for the idea, but it gets seriously emotional in the final chapters. There's a sneak peek of Lock In, and all I can say is that I immediately pre-ordered it.This is only $2, so why not check it out? 3.5 a prequel novella explaining the beginnings of Haden's Syndrome. Very interesting since it reminded me of the panic and unpreparedness, we on the states were for Ebola. That is where the similarities ended because this killed and killed fast. Some who survived were later locked in. What happens next is the subject of the book. Some strange and scary stuff. Fantastic prequel/companion to Lock In series. It made me think. Which Haden I'd be: the one spending more time in a cyber fortress of solitude or the one with her Threep chatting with friends in a cafe. Lots of moral and political dilemma when it comes to a global massive virus outbreak so the speculative fiction side of this near-future SF is fascinating. This novella is written in an epistolary form (as seen from the title), which I really enjoyed. The awesome zombie outbreak novel World War Z and one of my favorite Ted Chiang's shorts are also similar so I guess this format suits me well. For the three and a half of you who don’t know already, Unlocked is the companion novella to Lock In, John Scalzi’s thriller set in a future where Haden’s syndrome leaves millions locked in their bodies, conscious but incapable of voluntary movement. Where as Lock In was a mystery set within this world, Unlocked explains how Haden’s developed and how the technology and culture around Hadens sprang up.This is billed as an “oral history” and comes across that way. It’s snippets of transcribed interviews. Imagine a documentary featuring mostly expert interviews, minus any connecting narration from a host (which would have been cool). Each part covers a specific aspect of how the world has changed, from the time-course and effects of the disease’s spread to the response of world governments. There are “characters” in the sense that many people get interviewed more than once, and they come across as having somewhat distinct personalities. But I wouldn’t say there are protagonists or antagonists. This is not so much a story as it is a collection of related anecdotes.Unlocked is more an exercise in glorified worldbuilding than an expansion, prequel, or what-have-you to Lock In. It’s as if Scalzi made a wiki for the Lock In universe and then compressed it into a series of in-character articles. Don’t get me wrong: I love delving into the wikis for favourite series; I’ll spend hours reading TVTropes and Memory Alpha and the Mass Effect wiki. But it’s a different type of reading than reading a novel.For that reason, I wouldn’t herald Unlocked as an essential companion to Lock In. It’s nice. I bought the Subterranean Press edition, mostly because I like Subterranean Press. Molly Crabapple’s cover is gorgeous, but I’m sad there aren’t any illustrations within the text. Anyway, this book provides more depth into the origins of Haden’s. It gives Scalzi an outlet for showing he Did the Research without infodumping too much in Lock In, and if anything we should just all be grateful for that. I wish more authors took this approach.If you approach Unlocked with the idea that it’s a companion and an infodump, albeit a cleverly-disguised one, then you’re going to enjoy it. Not on the level that you would enjoy a novel. Similarly, I think you need to retain some interest in the world of Lock In—if you didn’t enjoy the novel, then this isn’t going to change your mind.But.There is one thing that makes this stand out from some of its less impressive peers: I got a little teary-eyed. As they were recounting the way that President Haden was grief-stricken for his wife, the way he stayed by her bedside and asked her what he should do, I teared up while reading this at lunchtime at work. I didn’t expect this book to get to me in that way.So make of that what you will. Unlocked is fun and interesting in its own way. It’s not required reading to enjoy Lock In, but it’s a companion in the same way a fan-wiki might be to other books. Note: This story can be read for free on: Tor.comExecutive Summary: An interesting short story that has me excited for Lock In later this month.Full ReviewI held off on reading this one until it was closer to the release of Lock In, and I'm glad I did. It did it's job, namely promoting that book and whetting my appetite. But now I have to wait.The story takes the form of a series of interviews from the people who were there, explaining the details of Haden Syndrome and doing an excellent job of world building. This is the first time I can recall a story in this format, and it seems really fitting. He's able to provide the details he wants to without it coming off like a giant infodump. And he does this while providing a variety of views on the matter without needing to do a lot of character development that would bog down such a short story.I'll be curious to see how he handles this in the novel itself. Will he expect readers to have done this short story first, and leave those who haven't confused? Or will he rehash much of what is here? I hope he's done it in such a way that people who haven't read it won't be lost, but those of us who have will be rewarded with an enriched experience. Time will tell.My recommendation without knowing the answer to that question is to check this out first if plan to read Lock In. Especially since it's free! This novella gives a lot of the background for Scalzi’s latest novel, Lock In. I was in kind of a reading funk, so I thought I’d try reading something short to whet my appetite for Lock In — or just fiction in general, really. It worked for me: I know what effect Scalzi is going for, and he manages to hit the sweet spot between being too technical and too much like a documentary, and offering glimpses of character (like the President) and an idea of the kinds of things in play when you get to Lock In.He gets the form pretty well, and while I don’t know much about the technology he suggests, I didn’t see anything completely impossible about the biological aspects of Haden’s syndrome. It pretty obviously draws on the Spanish flu of 1918 and the roughly concurrent encephalitis lethargica epidemic. There are separate diseases which produce the effects Scalzi posits for Haden’s syndrome, he just has them combined — with a suggestion that they have been deliberately combined.Overall, it can be quite a dry read if you’re not interested in that kind of background, but I am. Still, it’s lacking in real narrative and urgency because of the post-facto documentary nature of it. This companion novella to Scalzi's Lock In was as good as the book itself. I didn't realize it was free at Tor.com until after I finished the main book, and there was a few minutes of confusion on my part as I started Lock In; this would have been cleared up had I read/listened to Unlockedfirst.I really liked the oral history format and the cast of multiple characters. World War Z: An Oral History of the Zombie War was told in the same style, so if you liked that, you will also like this. This style is so appealing to me that I wish there were more like it... suggestions? (only few I can think of are Robopocalypse and the aforementioned WWZ). Scalzi's world-building is so layered and detailed. I loved the history of Haden's, the ethics of treatment, the technology for personal transports/"threeps", and the end section about daily lives of Haden's and their civil rights. I would suggest reading this one before the main novel, so the first few chapters of Lock In are not confusing (as they were for me, unfortunately). It's seems I'm a fan of the fictional oral history, having read and really enjoyed the only two examples I've heard of (this andWorld War Z: An Oral History of the Zombie War). I'm not surprised that Scalzi has produced a plausible history of an imaginary plague, but I am delighted. It makes for a good introduction and way to pass the time until I get a copy of Locked In.Personal copy. I read this after reading Lock In, and I think that's the right order. The oral history format works well here, but this story probably isn't as interesting to someone who isn't already familiar with Haden's syndrome and interested in how the United States handled the early days. The major criticism I had is that most of the people sounded pretty similar in voice, but they each had an interesting perspective. Cool concept, probably would have had more impact as a full novel. Also if all the voices weren't exactly the same. I should be able to tell a prison inmate and member of the secret service apart, you know? Read this free here:http://www.tor.com/stories/2014/05/un...I highly recommend you read this before you even read page one of the book that follows it. An oral history of a disease that changed the world. Put tears in my eyes. Only downside; all the speakers sounded alike, from the head of the NSA to the trust fund baby who funded the first avatar to the CDC investigators. Still, gripping, disturbingly plausible, and moving. Without having the context and story from Lock In, this series of short accounts would not mean as much. I know that it's listed as a prelude but I would recommend it to be read after the first book. It makes a lot more sense afterwards. Unlocked: An Oral History of Haden's Syndrome is a brief look at the origin of the devastating disease, the spread, affects, movement to study, experiments, robotic creation, snippets of real life moments, morality of choices and right of government influence. Are you less than human because you use a robotic body to move around? I listened to it as an extra that was given with the first book. It's amazing! Brava to the narrators! There's a large cast of voice actors and it really sounds like real live accounts told by people who experienced the different events. As a novella, this is one of the best I have listened to in a long time. It fits in so well with main story and makes you ask more questions about what may come up later on. I can't wait for the next book, Head On. God I can't wait for Head On. This was a great way of expanding the backstory of the Locked In series - this free short allows the novels to avoid infodumps, while providing an interesting, documentary-style look at Haden's Syndrome. Very well worth the minor time investment to get another dimension into a very different series.